Sumo Logic provides a secure, cloud-native, machine data analytics platform, to convert machine data into real-time continuous intelligence, providing organizations with the full-stack visibility, analytics and insights they need to build, run and secure their modern applications and cloud infrastructures.The Sumo Logic AWS GuardDuty app provides prebuilt dashboards to quickly leverage and centralize visibility into the security of your AWS GuardDuty environments. 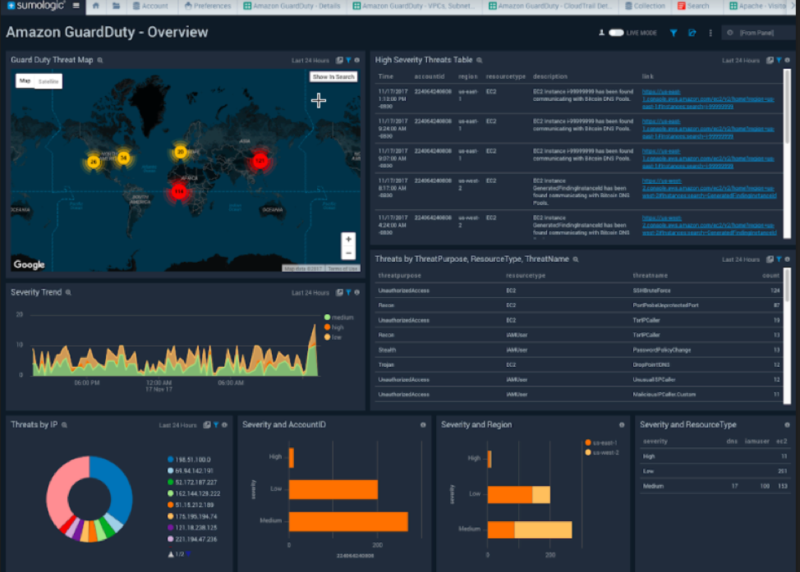 The Sumo Logic GuardDuty dashboards enhance and enrich the GuardDuty analytics feeds with rich graphical depictions of any security findings, trends in each of the AWS environments, identification of outliers, and other relevant event data over time to help in simplifying the management of security and compliance efforts. Gain rapid insights into the severity and frequency of GuardDuty findings for more rapid and effective remediation efforts. Simply click on any AWS GuardDuty finding from the Sumo Logic dashboard and instantly be routed to your AWS EC2 environment for rapid remediation efforts. GuardDuty findings and raw log data can easily be filtered by "tags" for more granular search and detailed analysis. Search "Tag" types include User ID, Region, VPC, subnet, instance ID, ports, IPs, Principle ID, Access Key ID, etc. Sumo Logic provides a single pane of glass to reduce the complexity of managing multiple environments, with pre-configured, user friendly and customizable dashboards that take GuardDuty’s linear data format and layers-on rich graphical reporting and depictions of trends over time. Complete visibility into the health and protection of your AWS environment through pre-built GuardDuty dashboards. Insightful graphic representation of the overall health of your deployment, to quickly spot, analyze and inspect any indications of non-standard security events. GuardDuty "findings" can be prioritized and customized for severity and risk. Monitor trends over time to better predict potential events before they occur. Simply "click to fix" with instant routing to your EC2 environment for remediation efforts needed. 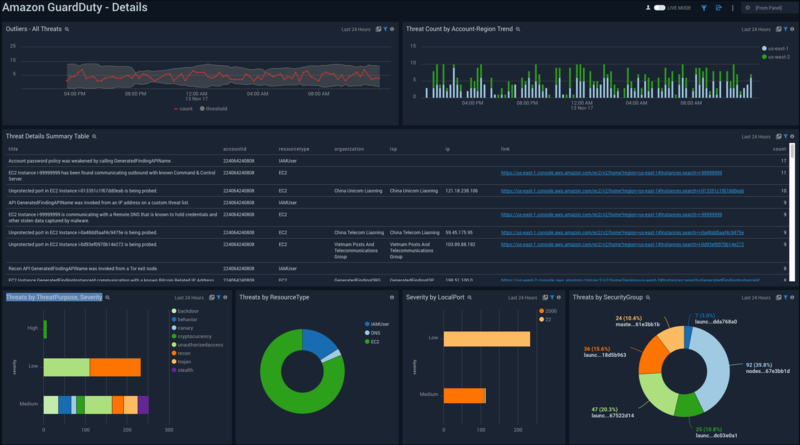 The Sumo Logic GuardDuty App adds additional sources of analytics for deeper and wider visibility in the AWS environment and context across the organization including full stack visibility into application/infra logs, Application/Elastic Load Balancer (ALB/ELB) performance, and supplemental threat intel provided by Crowdstrike for management of resources outside of AWS.